The remains of late Air Vice Marshal and co-founder of the Arewa Consultative Forum, has been laid to rest. Late Air Vice Marshal (AVM) Moukhtar Mohammed, a retired senior Nigerian Air Force (NAF) officer and co-founder of the Arewa Consultative Forum, who died in the United Kingdom on October 1, 2017, have been laid to rest. 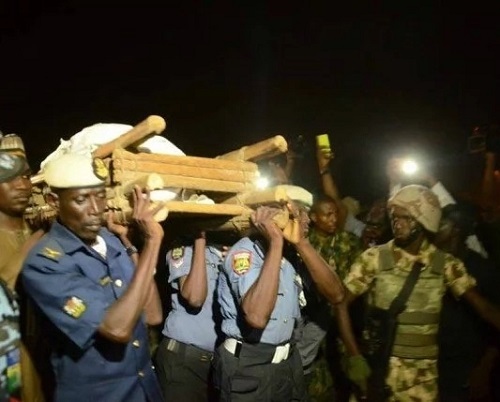 Mohammed’s body was flown in from London aboard a private jet, which landed at the Mallam Aminu Kano International Airport in Kano and was received by a mammoth crowd. The corpse was immediately driven in a NAF ambulance to the palace of the Emir of Kano, Alhaji Sanusi Lamido Sanusi, where prayers were said for the repose of Mohammed’s soul before the interment. Alhaji Abba Kyari, the Chief of Staff to President Muhammadu Buhari, led the federal government delegation to the burial ceremony. 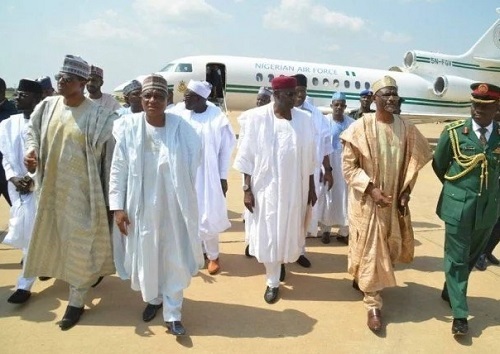 Other members in the team from the presidency include: Mansur Dan-Ali, the defence minister, his colleague in the interior ministry, Abdulrahman Dambazau, as well as that in charge of aviation, Alhaji Hadi Sirika. The Nigerian Air Force described the late AVM Moukhtar Mohammed as “a rare gem, an articulate and eloquent speaker as well as an astute administrator, who laid a solid foundation for administration in the NAF.